A pair of wildfires in Glacier National Park – including a newly detected lightning start in the park’s remote northwestern edge near the Canadian border – kept firefighters scrambling Friday. As a low-pressure system arrived, the 11,519-acre Howe Ridge fire gained more ground and put up a smoke column that caught everyone’s attention. Saturday’s report from the fire’s incident management team noted uphill runs, group tree torching and short-range spotting. 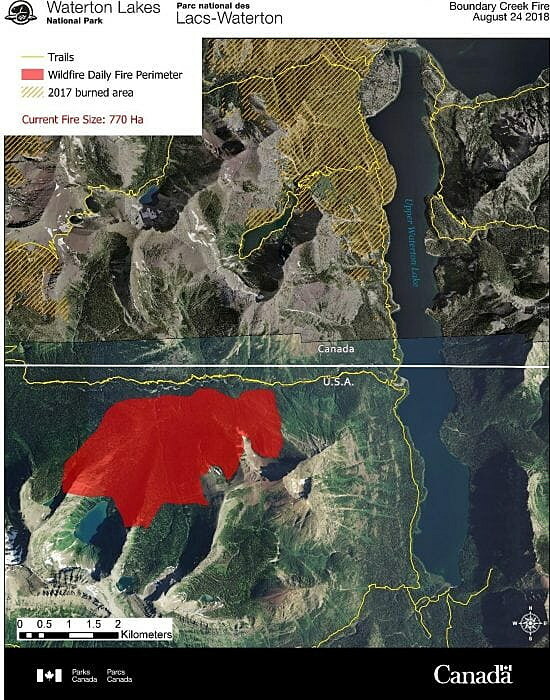 Meanwhile, the 1,800-acre Boundary fire has moved to within a mile of the Canadian border and Upper Waterton Lake after being detected late Thursday. Firefighters from both Parks Canada and the National Park Service tried to stop the flames using aircraft on initial attack but the fire behavior was too extreme, Glacier Park information officer Lauren Alley reported Saturday. Aerial firefighting was again prevented on Friday, this time by wind and smoke. Those realities shifted the focus to clearing all hikers out of the surrounding backcountry – trails and campgrounds – on both sides of the border, and on protecting 14 structures at Glacier’s Goat Haunt Ranger Station, which sits on the edge of Upper Waterton Lake. Alley said 24 firefighters from Glacier Park are at Goat Haunt, setting up pumps and a sprinkler system to protect the buildings should the fire continue its advance. All trails leading out of Goat Haunt are now closed. On the Canadian side of the border, officials said Saturday that “all areas and hiking trails in Waterton Lakes National Park are currently closed.” Much of that park burned in a 2017 wildfire. Boat tours operated by Waterton Shoreline Cruise Company continue on Waterton Lake, leaving from the Waterton townsite, but cruises are not landing at Goat Haunt. Alley said a cooler, wetter weather system is expected to reach the area Sunday night and Monday, but is not expected to slow but not extinguish the Boundary fire. The forecast in that area calls for below normal temperatures, rain and snow above 8,000 feet. On Glacier Park’s normally crowded western side, incident commander John Pierson reported Saturday that firefighters continue to use a sprinkler system and aerial water drops to slow the Howe Ridge fire. On Friday, the fire backed toward the Inside North Fork Road and there was some isolated torching in stands of lodgepole pine. Helicopters and the CL-215 “Super Scoopers” dropped water in that area to slow the fire’s growth. Ground crews continued to remove dead trees and brush along the Inside North Fork, in preparation for the road’s use as a fire line. Pumps and sprinklers are in place to provide structure protection, if needed, at the Fish Creek Campground. Pierson also reported active fire growth on the lower slopes of Mount Vaught, on the fire’s northern edge. The incident management team has made the protection of Going-to-the-Sun Road corridor a priority, and sprinklers are running along the Upper McDonald Creek trails to provide extra protection for the road. In addition, helicopters are doing bucket drops on the fire’s leading edge to slow its spread toward the road. Firefighters don’t want flames to cross the road, spreading the fire into a region of thick vegetation. Hoses and sprinklers also are in place to protect the Trail of the Cedars and the Avalanche Creek Campground, should the fire eventually reach that area. A structural protection plan also is in place for Lake McDonald Lodge and work has begun on plans for the town of Apgar and structures in that area. 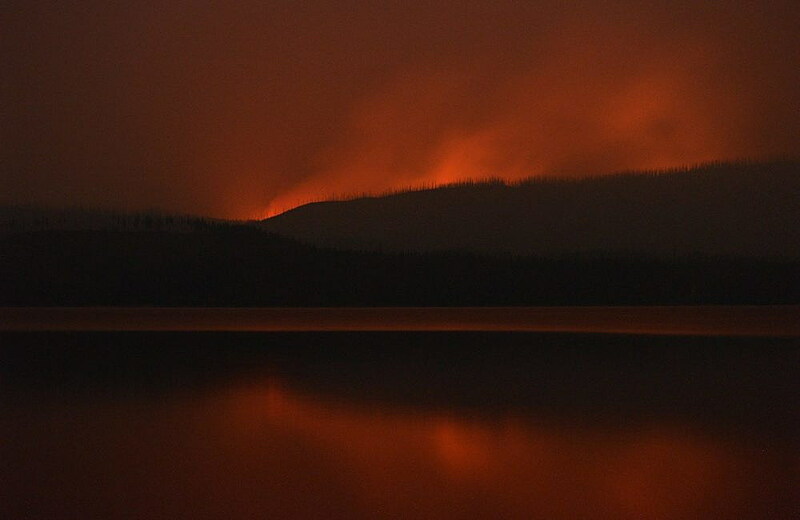 Evacuation orders are in place for the North McDonald Road (private residences and the Lake McDonald Ranger Station), Lake McDonald Lodge area (all businesses, employees, and private residences), private residences along the Going-to-the-Sun Road, and Sprague Creek, Avalanche and Fish Creek campgrounds. Road and trail closures: The Going-to-the-Sun Road remains open between St. Mary and Logan Pass. It is closed between the foot of Lake McDonald (near Apgar) and Logan Pass. The North McDonald Road and Fish Creek Road are closed. The Inside North Fork Road is closed from Fish Creek to Logging Creek. Multiple trail closures are associated with this fire. A full list of trail closures is on the park’s website: www.nps.gov/glac. Fire restrictions: Glacier National Park and most of western Montana are under Stage II Fire Restrictions. No campfires will be permitted in Glacier’s front country or backcountry. Smoking is also prohibited except within an enclosed building, vehicle, developed recreation area, or barren area three feet in diameter. Propane stoves that have an on/off switch are permitted. For a recorded Howe Ridge Fire update, call (406) 888-7077. For general Glacier National Park information, visit www.nps.gov/glac or call (406) 888-7800.